TALLAHASSEE, Fla. – After a nearly unprecedented three-week break, the Florida State football team will finally return to action when it hosts North Carolina State on Saturday at Doak Campbell Stadium. Here are the names, numbers and notes you need to know before the Seminoles take on the Wolfpack. Last game: All-purpose back Jaylen Samuels ran for three touchdowns as the Wolfpack topped Furman, 49-16, last week in Raleigh, N.C. Quarterback Ryan Finley added 231 yards on 22-of-27 passing. Last game vs. Florida State: Deondre Francois connected with Travis Rudolph for a touchdown pass with 3:09 to play that lifted the Seminoles to a 24-20 victory over NC State at Carter-Finley Stadium on Nov. 5, 2016. FSU trailed by as many as 10 points in the second half. Francois threw for 330 yards – the third-most in his career – and Nyqwan Murray broke out with nine catches and 153 yards. NC State vs. Florida State all-time: FSU leads the all-time series 26-11 (15-4 in Tallahassee) and has won four straight. The break came with at least one benefit, though: Extra time to prepare freshman quarterback James Blackman for his first career start. Blackman took three snaps late in the season opener against Alabama but has yet to throw his first collegiate pass. Both Fisher and teammates have expressed optimism about Blackman’s ability to lead the offense. He impressed throughout fall camp with a big, accurate arm, and veterans Ryan Izzo and Derwin James have both said that Blackman already commands respect in the locker room. Year five under coach Dave Doeren brings another year of questions about when NC State will break into the upper echelon of the ACC Atlantic Division. No one can say the Wolfpack hasn’t come close – NC State last season missed a last-second field goal that would have beaten Clemson, and dropped an interception that likely would have sealed a win against FSU. The Wolfpack entered this season with high expectations – one analyst even picked it to make the College Football Playoff – but those were quickly tempered by a loss to South Carolina in Week 1. Still, the Wolfpack have a talented, veteran defense and a quarterback who doesn’t throw interceptions. They ought to be a tough out for most teams on their schedule. The Seminoles lost a season-opener for the first time under coach Jimbo Fisher, but they’ve still got a sterling record in home openers intact. FSU is a perfect 7-0 in its first home game’s during Fisher’s tenure and 57-13 in them overall. NC State: Senior Jaylen Samuels is a triple-threat playmaker who can run, catch or throw. Although officially listed as an “H-back,” Samuels rotates between receiver, tight end and running back, and has shown that he can throw passes with accuracy, too. Samuels has scored five touchdowns this season and is near the top of the school’s leaderboard in both rushing and receiving. On defense, end Bradley Chubb will be charged with making Blackman has uncomfortable as possible. A 6-4, 276-pounder with NFL lineage (Brother Brandon played for the Detroit Lions, father Aaron played for the New England Patriots and cousin Nick is a running back at Georgia), Chubb had 10 sacks a year ago and has posted 1.5 this season. Florida State: Conventional wisdom suggests that, with a new starting quarterback, FSU will lean heavily on its running game. But Fisher loves to zag when people think he’s going to zig, and it shouldn’t come as a surprise if he opts to throw more than expected. With that in mind, tight end Ryan Izzo could be in for a big game. He already got off to a nice start in the season opener against Alabama (two catches, 35 yards) and could help Blackman get into a rhythm with some short or intermediate completions. Cornerback Tarvarus McFadden, the nation’s interceptions leader a year ago, will be going up against a quarterback who doesn’t throw interceptions. NC State’s Ryan Finley has gone 192 attempts without a pick. If McFadden can reverse that trend, it will like make things that much easier for the FSU offense. “It’s real personal. Especially getting to go home and play my last game at Florida State. There’s always motivation, especially when I get to go home and see my family. It’s a big motivation to play in front of them.” – NC State linebacker Jerod Fernandez, a Samford native, on returning to play in his home state. When given more than a week prepare (including season-openers), the Seminoles are 22-7 under Fisher. FSU is 15-4 all-time at home against NC State and has won five straight against the Wolfpack in Tallahassee. NC State QB Ryan Finley has thrown 192 consecutive passes without an interception, the longest active streak in the nation. The all-time NCAA record belongs to former NC State QB Russell Wilson, who went 379 attempts without an interception in 2008-09. Incidentally, three former FSU QBs are right behind Wilson on the ACC’s all-time leaderboard – Drew Weatherford threw 270 passes without an INT in 2007, while Christian Ponder (2009) and Chris Weinke (1999) each went 237 passes between interceptions. NC State has lost 10 straight games against ranked opponents. That streak includes four losses against FSU. The Wolfpack’s last win against a ranked team? A 17-16 victory over No. 3 FSU in 2012. Saturday marks Military Appreciation Day at FSU. Senior defensive end Rick Leonard, whose brother, Billy, serves in the U.S. Army, will carry the American flag and lead the Seminoles on to the field. There will also be a flyover of three F-16 Fighting Falcons, one of which will be piloted by FSU graduate Jeffrey Entine. Sixty years ago, NC State visited Tallahassee to take on the Seminoles in Doak Campbell Stadium. On the field for the Seminoles that day was a young cornerback named Buddy Reynolds. It was the last game Reynolds would ever play for FSU. After suffering an injury in the 7-0 defeat, Reynolds left the team to pursue bigger and better things. No surprise that there are loads of features about James Blackman. Here’s one from Sports Illustrated. And one from ESPN.com. And one from the Tallahassee Democrat. And another from Noles247. And Warchant.com. Jim Henry of the Tallahassee Democrat spoke with Rick Leonard about what it means to carry the American flag and lead his teammates through the tunnel at Doak Campbell Stadium. Bob Ferrante of the Osceola takes a look at the history of quarterbacks making their first starts under Jimbo Fisher. Tim Peeler goes more in-depth with the legend of how NC State ushered in the Hollywood career of Burt Reynolds. Peeler again, with a look at a 1954 game between FSU and NC State that was played despite both a hurricane and a polio outbreak. Who would have guessed that a late-September game against North Carolina State could turn out to be one of the program’s most intriguing contests in years? A three-week break, a new starting quarterback and plenty of questions surround Florida State’s latest home opener since 1977. Will the team be rusty due to the extended break? Will it be sharp after practicing for three weeks without a game? And how will James Blackman look when all the buzz and chatter falls away and he’s actually under center in front of 80,000 people? The answers to those questions might determine the final score of Saturday’s game, but they probably won’t affect who wins and who loses. Even without Deondre Francois, FSU is loaded with talent at the offensive skill positions and, even better, loaded with talent on defense. 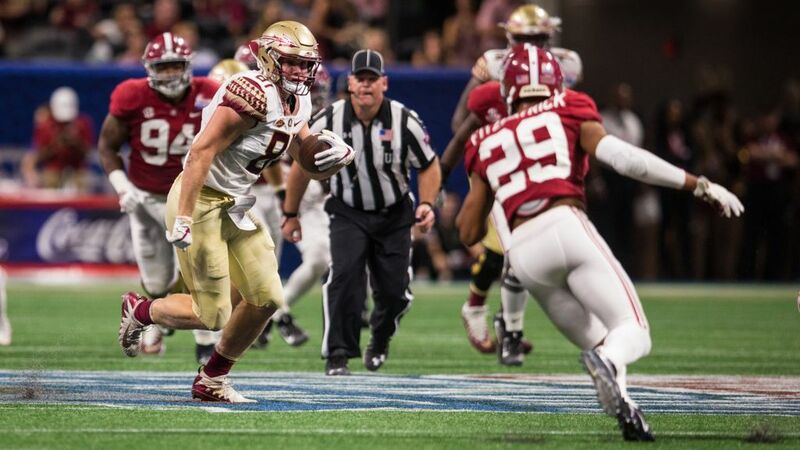 It’s easy to forget – it was, after all, a long time ago – but FSU’s defense looked outstanding in the opener against Alabama, and it’s unlikely that it got worse over the last three weeks. The game could be close if the offense takes a while to find its footing, but FSU’s defense should ensure that the Seminoles prevail.